A while ago people of all ages lived together in extended families and communities, sharing care and doing jobs for one another. Now we are increasingly living in silos: older people in retirement homes and villages; middle-aged hipsters in urban apartments; young people might still live with their parents, but often not out of choice; wealthier parents swarm together around good schools. People are becoming more isolated and lonely to the extent that they’re dying early. What if we could take this old model of sharing and apply it modern living? The joy of modern life is the freedom to move around, but in loosening family and geographical ties we also lose something important. What if the way that people live together could enable helping one another, spreading the cost of childcare, elderly, health or disability care and rent among people who are not necessarily related? We think design can encourage this and we’re working on an intergenerational housing prototype to see how it can work. 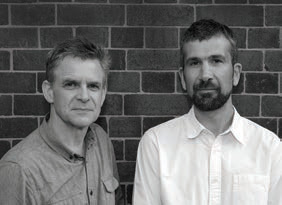 Roland Karthaus and Jonathan McDowell co-founded Matter Architecture in 2016. It is currently working on a wide range of projects across all building types and scales, for public, private and trustees clients. These include community and education projects, housing, commercial, infrastructure and bridges, public realm, urban design and masterplans.